Fruit machines will forever hold a special place in the casino industry. If you have ever thought of combining the retro classic three reel slot machines with the new modern bonus features and multiple pay lines of the video slot. Play Thunderkick's Zoom slot game. This game comes packed with a stylish theme and unique symbols such as the scatter and the large and super massive symbols. Even though the developer has used traditional symbols like Stars, 7s, Grapes and Watermelon, they are highly polished to match the high end graphics used. You will also notice that the letter 'W represents the wild symbol in the game.' Besides the exclusive symbols, this slot is played with six reels, four rows, and 64 pay lines. With a variance ranging between medium and high and a theoretical return to player (RTP) of 96.2%, Zoom slot is suitable for players with different budgets. Thunderkick is rapidly making a name for themselves as one of the best video slot developers in the iGaming industry. Enjoy this thrilling online slot game on the go from merely from the comfort of your home on your personal computer, tablet or smartphone. While the developer offers a modern classic theme, they have maintained it simple but very attractive. The colors used are bright and vibrant to catch your attention and immerse you in the game. The reels are set against a purple background with visual animations of different geometric shapes moving across the playing screen. All the gaming symbols and icons are blend perfectly with the theme of the game. You will notice the background color of the game change when the large/super massive symbol re-spins are triggered. Also, the flashlights will zip around the settings of the reels on Big, Mega, and Ultra in celebration of the wins. Lastly, the soundtrack is soothing, and you will occasionally hear sound effects that will remind you of the brick and mortar casino days. One thing that Thunderkick have achieved in this modern fruit machine is the sleek and straightforward user interface. What is unique in this slot game are the 6 Zoom Areas on the four by six format that occupies a two by 2 area. The gameplay is standard, from left to right except for the scatter symbol. To win, you must land 3 -6 matching symbols beginning on reel 1. The total betting range in Zoom slot is from $0.01 up to $10 per spin. Use the Bet function located beneath the reel set to adjust the playing bet at any point during the game. Start the game by clicking on the feature found in the bottom right corner of the screen. The Autospin button will allow you to play up to 5000 spins without interruption.The value of balance, the Total Win and Bet are found at the bottom of the gaming screen for easy accessibility. 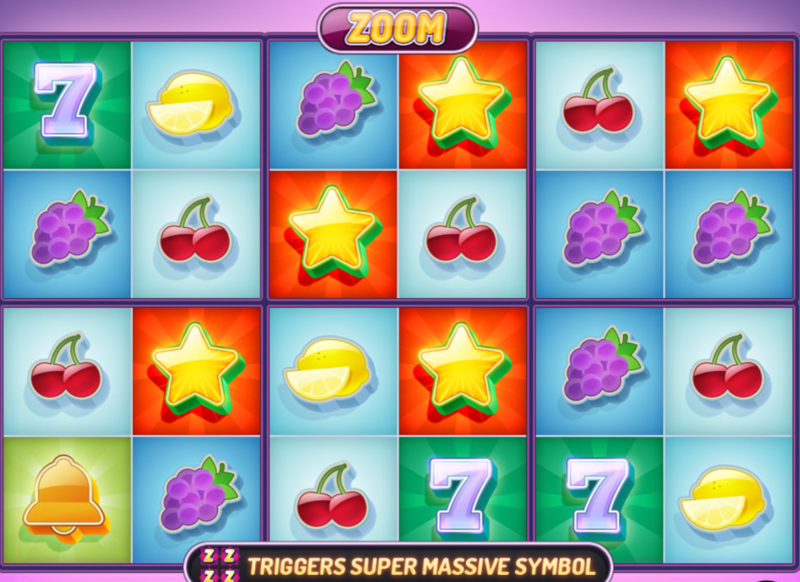 Thunderkick's Zoom slot comes with classic symbols of traditional fruit machines. There are nine symbols in total including Fruits, Bells, 7s and Star. You will find two special symbols including a Wild and Zoom Scatter symbol. There are also seven low paying symbols represented by different fruits like Cherry, Lemon, Watermelon, and Grapes. The wild symbol will team up with the star symbol to become the highest paying icon in the game which can reward up to 12.5x the bet for 5 of a kind. The Star symbol is the most valuable icon since it can form winning combos with 3 to 6 matching symbols, contrary to the wild symbol which can only create one winning combo. The fun part of the game is when the Re-spin Features are combined with the Stars and Wild to reward a payout of up to 1500x the bet in a single game round. This will pay a whopping $150000 coins if you bet with the selection of $100. Being a classic themed video slot, you don't expect to find numerous unique features. However, Zoom slot comes with the Wild and Scatter symbols to increase your chances of hitting the highest prize. It is represented by the word 'Wild' and has the power to substitute any icon in the game to complete winning combinations except the scatter symbol. The letter 'Z' represents the symbol, and it can expand into a Massive symbol as well as activate the Re-spins. When a zoom scatter symbol appears on the reels, it will trigger the expansion of a Mazzive symbol which will occupy a whole 2x2 'Zoom Area' and activates an automatic re-spin. The Massive symbol will remain fixed in place as the rest of the slots are replaced. There will be only one zoom symbol that will remain fixed during the Re-spins, and only 1 Re-spins is activated despite the appearance of Massive multiple symbols produced by the single spin. A Super Massive Symbol covering a 4x4 will form when 4 Massive symbols or a square of 4 Zoom scatters showcase next to the reels. These symbols also can activate the Re-spin feature. Mobile gaming is the future of the gaming industry, and Thunderkick seems to understand this quite well. As such, all their video slot games are built with modern technology such as HTML5. 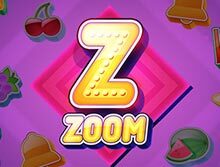 Zoom slot is created with HTML5 technology which makes it flawless and with high end graphics on small screen devices like smartphones and tablets. Like other slots fromThunderkick, you don't have to worry about downloading an app on your device. Zoom slot is available instantly through any browser including Chrome, Firefox, Opera and Safari. Thunderkick in a relatively new game studio based in Stockholm. It opened its doors to the world back in 2012 and has since been rated as the best video slots developer. Their games are exceptional with state of the art graphics, immersive visual animations, and beautiful themes. Thunderkick is responsible for some of the popular slot titles in the market like Esqueleto Explosivo, 1429 Uncharted Seas and Magicious among others. Other than developing games, Thunderkick also runs a Remote Gaming Server (RGS) in their Stockholm offices. Their games are available in leading online casinos in the UK and across the world. If you are looking for a UK based online casino with an incredible welcoming bonus offer, then you need to try bCasino. Our site is legal as the UK Gambling Commission licenses it. Since 2018, we have bee offering players around the world with some of the most exciting games from giant software developers such as NetEnt, Evolution Gaming, Pragmatic Play, Playson, Yggdrasil and Play n Go. Besides the incredible bonus, we have ongoing daily, weekly and monthly promotional offers to ensure that you never lack a spin. We accept a wide selection of secure payment options like Mastercard, Skrill, Neteller, Paysafecard and Pay by Mobile as well as different currencies to cover players from a different location. We secure our customer's personal information and online transaction with the latest SSL encryption software to ensure that it does not leak to unauthorized people. Play at bCasino today and enjoy our excellent customer service from trained and friendly support agents via email, live chat, and telephone.